At a dinner party last night recently I showed my guests “Eyebrows”, the latest Glass and a Half Full Productions video from Cadbury. It’s a minute and a half of eyebrow raising fun accompanied by a remix of the 1980s Freestyle hit, “Don’t Stop The Rock”. I explained that this was Fallon London’s follow up to the Gorilla and Truck ads. Discovering they hadn’t seen either we proceeded to YouTube, only to discover that the Phil Collins track, “In The Air Tonight”, had been replaced by a range of lame non-synchronized tracks. The explanation? 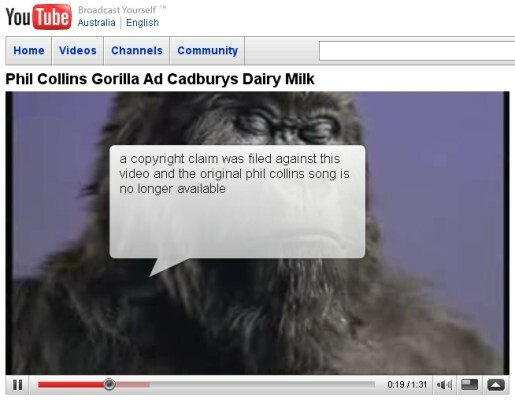 A copyright claim by Warner Music Group. Warner Music Group signed a deal with YouTube in September 2006, agreeing to distribute on YouTube the library of music videos from their rosters of musicians, along with behind-the-scenes footage, artist interviews, original programming. YouTube users would even be able to incorporate music from WMG’s recorded music catalog into the videos they created and uploaded onto YouTube. The deal included sharing revenue from advertising on both music videos and user uploaded videos, using YouTube’s royalty reporting system. Warner Music videos often were able to be embedded into blogs and other sites. Two years later, negotiations on just how revenue is made and shared have fallen down. Warner Music was apparently unhappy with the haphazard nature of Google’s advertising regime, a situation made more difficult with the drop in advertising revenue across the online industry. The deal between Warner and YouTube came unstuck. Music videos on the WMG YouTube channel have disappeared. YouTube over the last few weeks has given users with Warner-licensed music the choice of taking down videos, muting tracks, or replacing tracks with royalty-free music. This is the beginning of my column at USA creative recruitment site Talent Zoo. See the rest of the article.